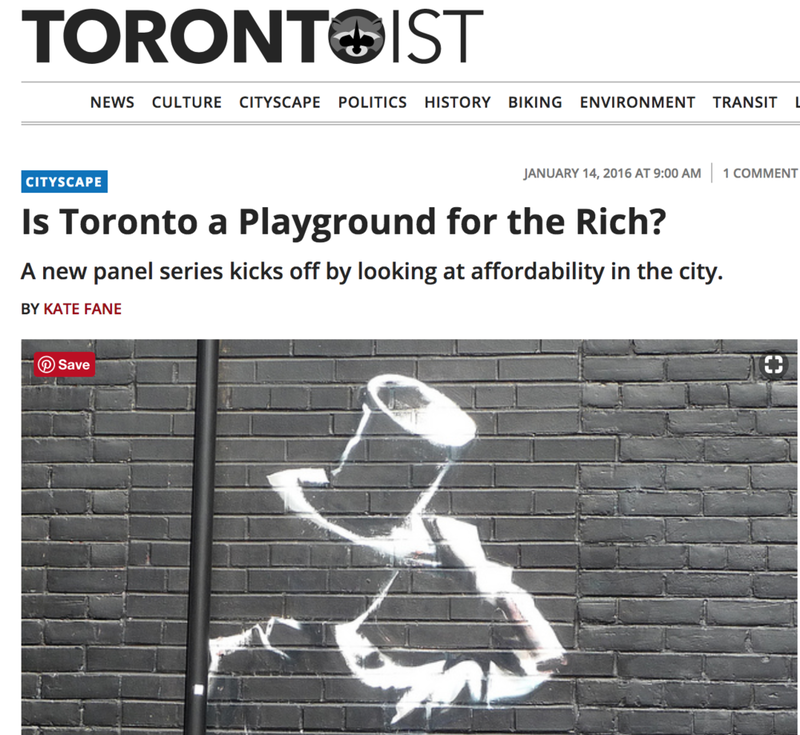 Be it resolved: Is Toronto a Playground for the rich? Torontoist spoke with panelists from "“Be it Resolved: Is Toronto a Playground for the Rich?,” Andray Domise, Shawn Micallef, and Jacquelyn West about why Toronto is particularly affected by income inequality, the ramifications for our growing city, and what we as individuals can do to create a more equitable community. "West feels that we as citizens haven’t demanded the returns we’re owed from the city’s lucrative period of development. “Our neighbourhoods are effectively disappearing to the highest bidder. In Toronto our systems of control have not kept pace with growth, and an appetite from land-owners for quick dollar bills supersedes long-term consideration of the people who inhabit our city. We have left the design of our modern urban communities to developers who for the majority, are seeking the quickest and highest return per square foot.” " Continued here.